This family loves capers. Whenever I see a recipe using them, I always put it on the list to try. 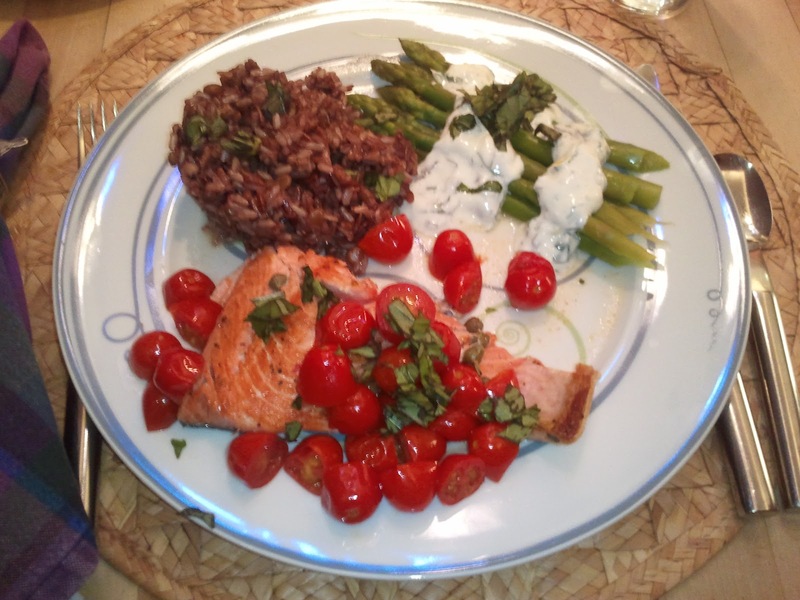 In perusing my new cookbook- Cooking Light fresh food fast 24/7, I found what looked to be a tasty salmon recipe that uses capers- Pan-Roasted Salmon and Tomatoes (266 calories). It was simple enough to make and the flavors really were tasty! As you can see from the photo, it is also visually appealing, a key aspect to a successful dinner. I wrote a blog earlier in the week on the asparagus that accompanied the salmon- Asparagus with Lemon-Basil Yogurt (46 calories). I recommend you check out that recipe too. To complete the meal I added a 1/2 cup of mixed rice (108 calories) for a total calorie count of 420 for the meal. Sprinkle salmon with salt and pepper. Heat a large nonstick skillet over medium-high heat. Coat pan with cooking spray. Add fillets, skin side up, to pan. Cook 3 minutes or until browned. Carefully turn fillets over. Add tomatoes, wine, and capers. Cover and cook 7 minutes or until salmon flakes when tested with a fork or until desired degree of doneness. Sprinkle with basil. Yield: 4 servings (serving size: 1 fillet and 1/4 cup tomato mixture.